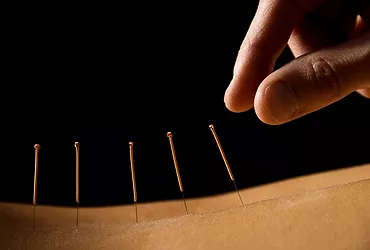 Acupuncture is the stimulation of key points on the body by the insertion of needles to prevent or modify the perception of pain or to normalize physiological functions, including pain control, for the treatment of certain diseases or dysfunctions of the body. We utilize traditional acupuncture methods, as well as contemporary trigger point therapy aka dry needling treatments. Auricular Acupuncture is a microsystem on the ears that represent the body, this can be an adjunct to a treatment or stand alone. Auricular Acupuncture utilizes both Nogier and Chinese ear mapping systems. Reduce fine lines and wrinkles, give your face and neck a natural lift, without the drugs and chemicals. 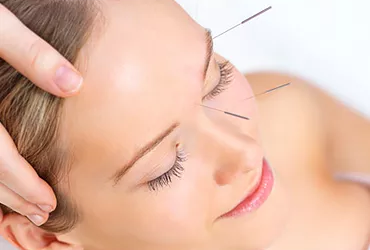 Acupuncture is a great way to help stimulate collagen production and help the face stay youthful looking. We understand most people want a natural way to look and feel younger. Acupuncture is a natural procedure, just like diet and exercise there needs to be regular maintainance. Most Facial Acupuncture treatments take 5 to 6 treatments to see a remarkable difference. 10 treatments are recommended for full affect then once a month for maintainance. This may vary with every person. We understand to achieve a more natural youthful look, treatments needs to be on a regular basis. Our therapists are trained in many forms of massage techniques including Swedish, Acupressure, Reflexology, Shiatsu, and Thai to name a few. Our massage therapists will customize their techniques to give you the right massage to fit your needs. We offer 60 minute and 90 minute massages..
Dry Needling Acupuncture treats chronic and acute muscular pain. This treatment focuses on acu-motor points and trigger points in a more in-depth way by releasing muscular trigger points (knots) . As acupuncturist we have a vast knowledge on these type of acupuncture points and use both contemporary knowledge of the muscular system and research as well as traditional theories using meridians (fascial lines and energetic lines) to achieve longer lasting and more effective treatment outcomes. 30 min and 60 min treatments available. Soft tissue mobilization effectively breaks down muscle ahesions, scar tissue, fascial restrictions and help improve range of motion alleviate pain. Modern term for this technique is "scraping". Similar to Graston used by chiropractors and IASTM(instrument assisted soft tissue mobilization) treatments. 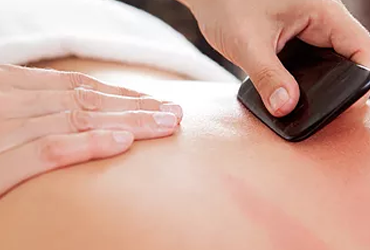 Gua Sha is the original technique from Asia, practiced for thousands of years. Philosophy and theories may use a different language but the outcome of treatment is the same. 30 Minute Appointment: Cupping can affect tissues up to four inches deep—impacting blood vessels, fascia, muscles, and scar tissue. ... Cupping decompresses adhesions and scar tissue, relaxes muscles in spasm, decreases trigger-point pain, and decreases tissue changes and inflammation following traumas. also know as Myofascial decompression. We use vacuum pump cups only. Michael Phelps and other 2016 Olympic Athletes have been using cupping therapy as part of their training and recovery routine. If a treatment has been rendered, then there are no refunds for that service. If treatments have been rendered in a package, then those treatments will be charged at full price, and not at the discounted package rate. The refund will be subtracted from the used treatments.